In my last installment, I shared how Greg, Tim, and I prepared Intuitive Company for success by focusing on creating an open work environment in every sense of the term. Planting, or placing the right elements into the mix, was our next step. We wanted every aspect of our environment to be a positive influence and encourage great work. You can’t achieve that without first having the right people. Our employees are the “seeds,” if you will. When Intuitive Company was founded, we decided to not only take our time bringing on new people, but to also focus on hiring senior level professionals first. This established a mature culture from which to further expand and minimized the growing pains that can sometimes result from bringing on several young employees all at once. Methodically hiring senior professionals in the early days also enabled us to realize our dream of having a “lead by example” culture once we started filling out our team. As such, we’ve never needed any official training or mentoring. It’s a true learn-by-watching (or doing) environment. To expand upon this further, the openness we strive toward can only be achieved if we’ve picked people who are transparent about how they work and what they’re working on. Greg, Tim and I also need to be clear about what our expectations are. We’ve found the best way to encourage transparency is to show the rest of the team how heads-down hard work will lead to rewards (more on that in a future installment), and how egos or politicking will not be tolerated. As such, the two other principals and I continue to complete hands-on project work—which serves the double purpose of keeping us fresh while also allowing our younger employees to learn firsthand. There’s a culture of respect and appreciation for the leaders who lead and the doers who do. Further, everyone can see and hear Greg, Tim, and I communicating with each other—making decisions, discussing client projects, and planning for the future. This helps reinforce a feeling of belonging among all employees. Let me be clear: It’s not just the founding principals who are leading by example—everyone does. That’s because we’re picking the right people to join us. And when the right people are in an open, respectful environment such as ours, it gives even a young buck the opportunity to make an impression on the old dogs—to teach us new tricks, as the saying goes. Reassess what type of culture you’re trying to build and figure out how to bring on people who will help grow that atmosphere. Establish a strong foundation for your group to expand from by getting the right people in place and then letting them learn from each other, rather than work in a vacuum. Make sure you’re setting the right example, too. Sandy has been Intuitive Company’s Creative Director since our humble beginnings and is a constant driving force of quality and innovation. Sandy previously was the Interface Design Director for Chase and directed the team responsible for all Chase public marketing and secure banking online experiences. 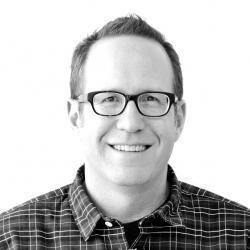 Having graduated in 1989 from Carnegie Mellon University with a BFA and focus on Interaction Design, he’s worked in small to medium sized digital and print agencies in NYC and Philadelphia, from hands-on Designer to Director. In addition to all the accomplishments, few know that Sandy sports a creative past as Art Director for a small independent record label (Bar/None Records in Hoboken), an indie-rock magazine (Big Takeover), and developed an ID Magazine award-winning furniture line (eat your heart out, IKEA). He’s also the proud owner of a car his kids think is cool, especially since acquiring the after-market rims. Great stuff Sandy! inspiring ! I hope one day to have a company with that mindset ! Keep up the good work! Take care….